Illustration Arts Fest posters featured the works of André Wee and Caleb “bucketcaleb” Tan. 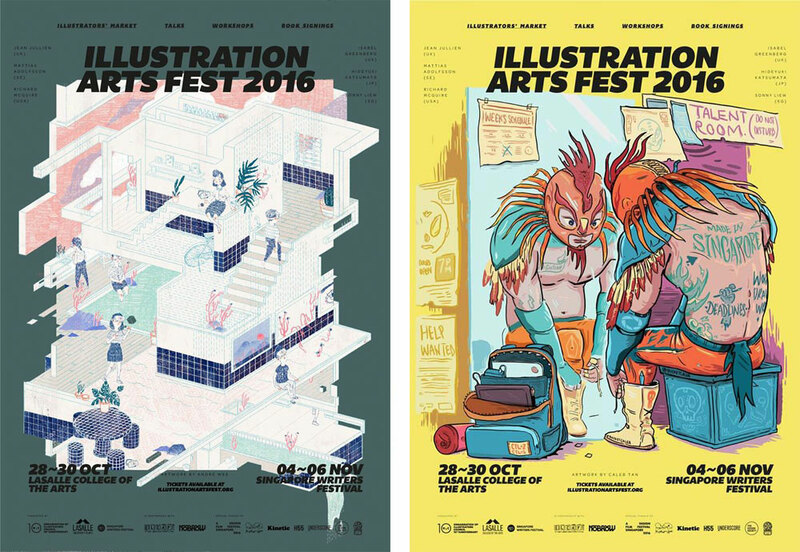 What started ten years ago as drawing sessions for a group of illustrators in Singapore has grown into the inaugural Illustration Arts Fest (IAF), marking a milestone for Singapore’s illustration scene. The event is overseen by festival director Michael Ng (better known as Mindflyer), and takes place over two weekends that bring together local illustrators and comics creators for workshops, talks, and a marketplace. According to Ng, it’s the “ultimate climax” for a loose network of illustrators that he co-founded with Lee Wai Leng (Fleecircus), and Andrew Tan (Drewscape), the Organisation of Illustrators Council (OIC). Cheaper, faster, and a new aesthetic — this is what Risograph printers can offer to the local creative scene, says two new presses offering this technology in Singapore. This year, Push—Press as well as Knuckles & Notch launched separately to offer printing services based on this Japanese invention. Both press founders discovered Risograph printers in the West, where it has become popular amongst designers and artists, and wanted to introduce this tool to Singapore. While this printing technology has been around since 1980, it has mainly been used inside schools and churches as a cost-efficient high-volume printer for documents of just one or two colours. In recent years, however, graphic designers and artists have caught on to this technology, introducing them into design studios as well as setting up independent presses. Both Push—Press and Knuckles & Notch claim to be pioneers in offering Risograph printing as a service in Singapore.